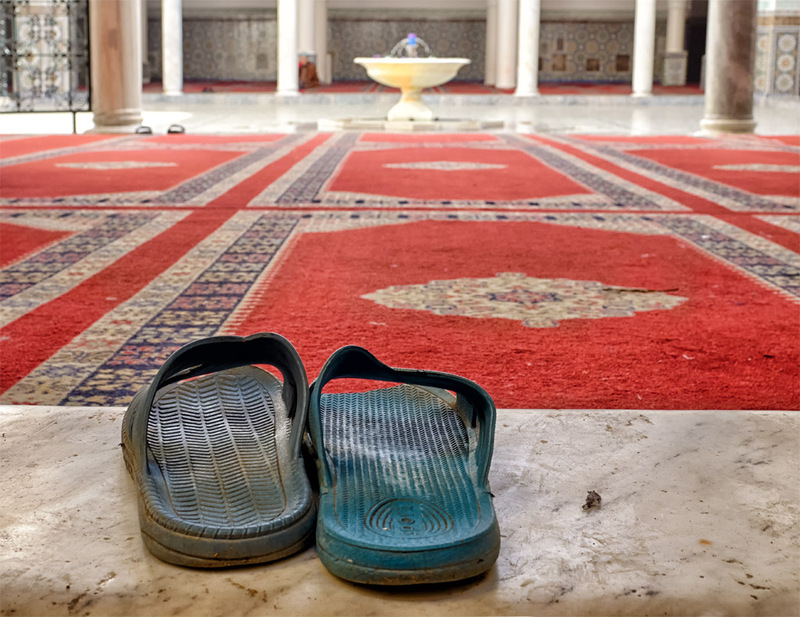 One of our newest photography travel tours to include Fes, Meknes, Volubilis & Chefchaouen. Ideal for returning guests, it’s focus is the medinas of the imperial cities including architecture, street scenes, as well as the landscape possibilities of Volubilis and the Cascades du Ouzoud. Geared for street photography and abstract architecture, the feel of the northern cities is distinctive. Nothing entirely sets you up for Fes. The world’s exclusive in place medieval city, an overflowing warren of obscured back streets and Fondouks. 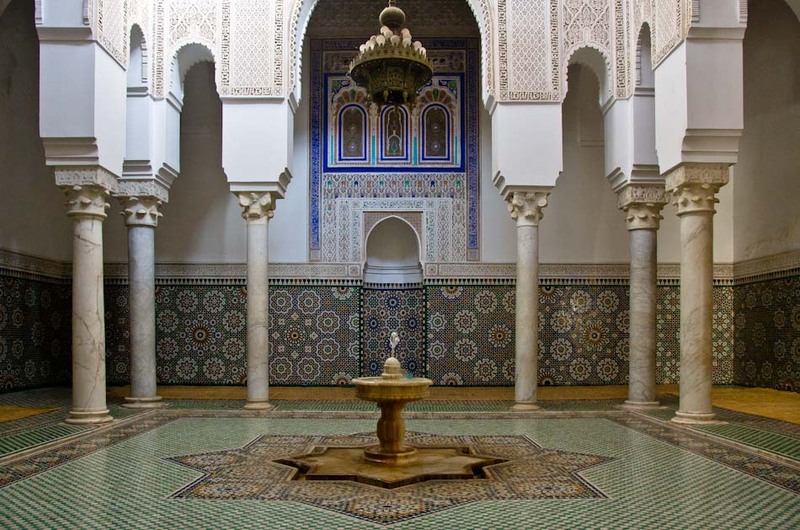 Close-by Meknes is another old supreme city, a majestic show-stopper orchestrated by Sultan Moulay Ismaïl. His mausoleum is a worthy location to photograph as is the late afternoon light on Bab Mansour gate. 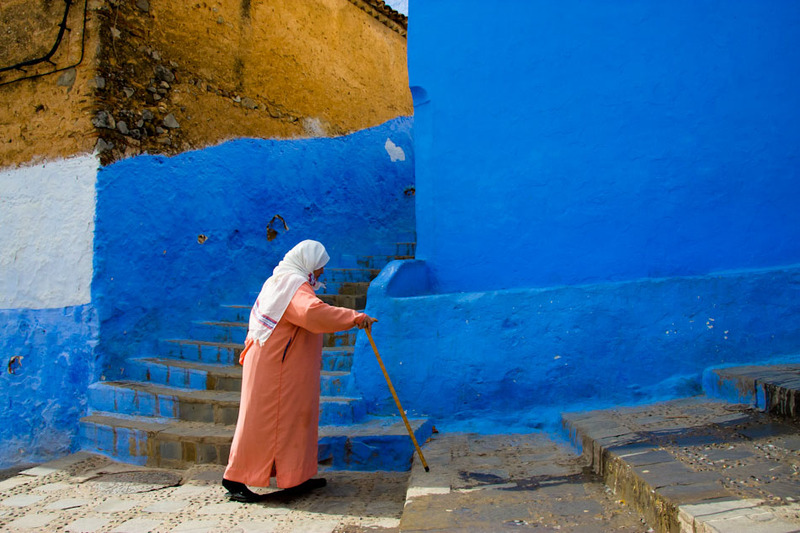 Hidden deep in northwestern Morocco set against the dramatic backdrop of the Rif Mountains is Chefchaouen. Filled with white-washed homes with distinctive, powder-blue accents, Chaouen is a small, quiet atmospheric town and relaxing place to explore with your camera. Fes has a big, beautiful medina – it’s a large, traffic-free bazaar, with narrow steeping passageways. Arriving here feels like arriving in another world; it’s sights, smells and sounds of the market, the old city and its historic walls. 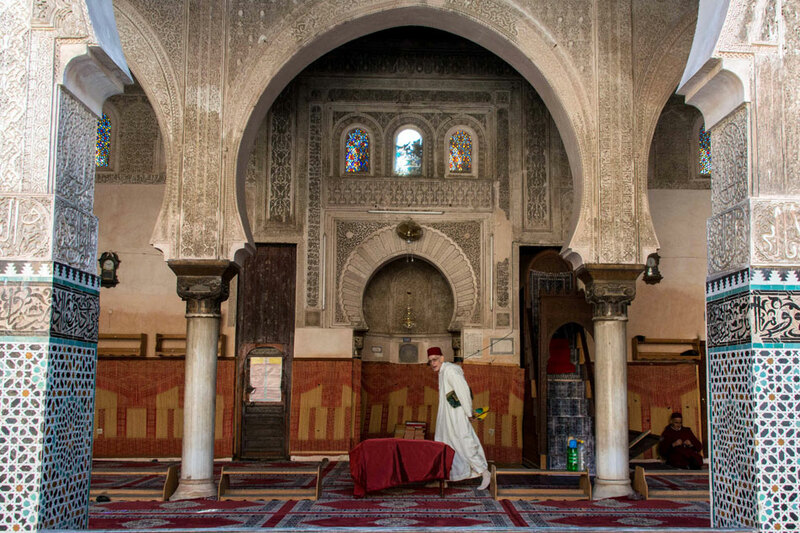 Meknes is cool grand, open and more a mix of the old Morocco and the new but with some historic gems and a Jewish quarter Mellah that’s worth exploring. Chefchaouen appeals to so many people due to it uniqueness. With a central fortress and square it feels very Spanish. Built on a hillside you can imagine when climbing the stepped streets you’re on a Greek island until you get to the restaurants of course. 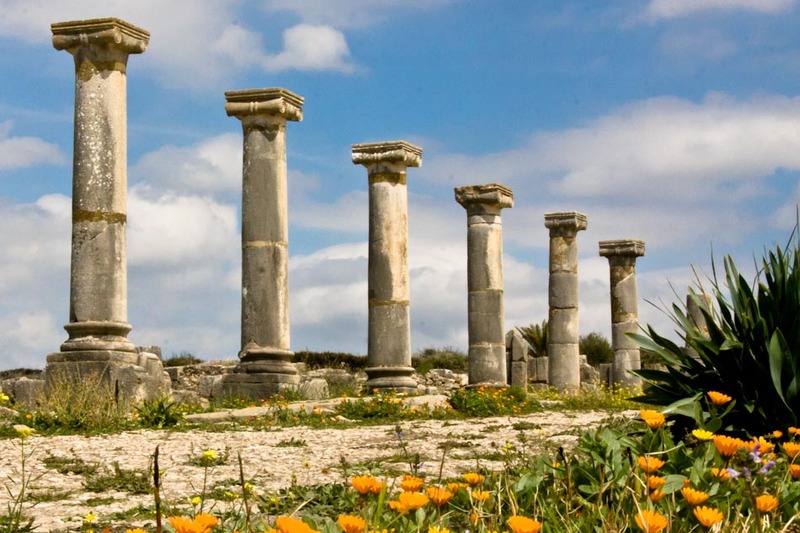 Volubilis and the cascades, the largest in Morocco, are both prime photographic locations. Your images are our priority. Those that have been on the photography tours are pretty focused on getting great shots and as we’re mostly city based you’ll be photographing all day as the light allows this. The mix for this trip is between architectural scenes, general scenes and some landscape. There are no family introductions for this tour but portraits are possible particularly in Fes. We cover about 1600km but you’re not traveling each day and you’re not constantly changing hotels. The big journeys are on day 2 and day 9. Bring your laptops and plenty of cards – you’ll be shooting a lot of photos across different genres giving you a huge variety of imagery. From Marrakesh we travel north of the High Atlas into the middle Atlas. Our arrival at the Cascades de Ouzoud before lunch leaves the afternoon to photograph the falls. Day 2 is a long drive to Fez, about 6 hours. You’ll have 3 nights in Fes which gives us 2 days of photography there. Then it’s further north, about a 3.5 hour drive to Chefchaouen and 2 nights there exploring the blue city. Our next location is back down to Volubilis and then onto Meknes for 2 nights which gives us one full day there. Day 9 is about returning to Marrakesh in time for evening flights. The range of genres you’ll be photographing is varied. There’s some tripod work to be done at the Cascades de Ouzoud and Roman ruins of Volubilis where you’ll have time to pick out some compositions. 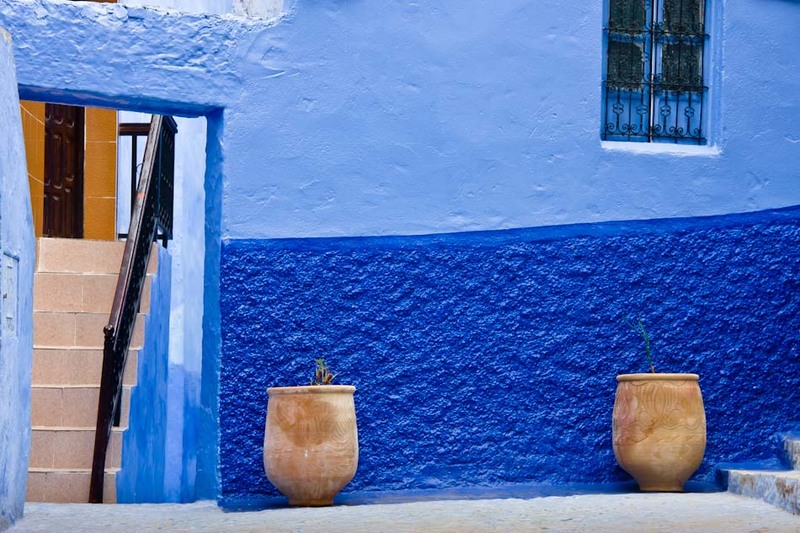 Chefchaouen is all about street work in a relaxed location. 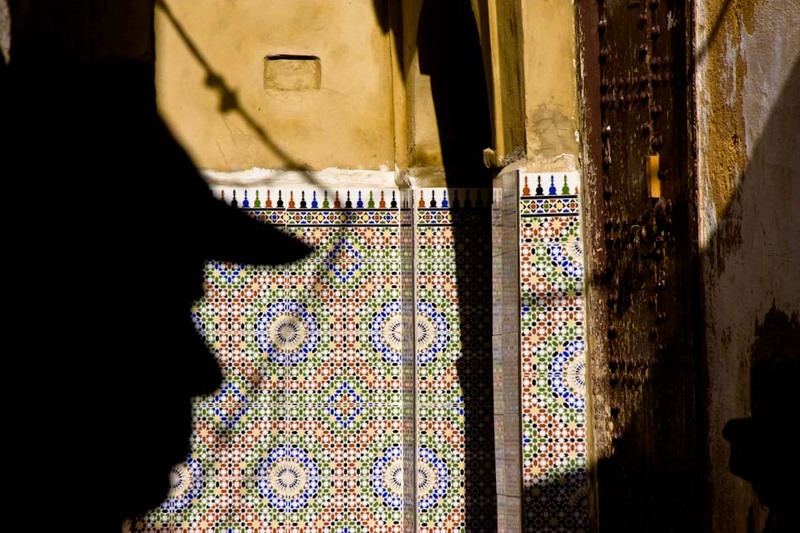 Fez and Meknes are a mixture of street photography and architectural imagery. There are characters in Fes selling goods who you can approach for portraits. As per usual the tour is primarily about building a portfolio of great images for personal or competition use. We’ve recently had photographers with a picture agency remit. Take a look here for a 2016 tour portfolio courtesy of Cosmo Condina. The walled in cities of Meknes and particularly Fez are a joy to wander. Meknes has Bou Inania Madrasa(religious school) and the main gate Bab el Mansour as well narrow streets and markets to explore light and shade. The Mausoleum of Moulay Ismail is a jewel and currently under renovation. Fes is really a delight to explore. The narrow streets offer several Madrasas such as Bou Inania Medersa which you can enter and photography as well as Zaouia Moulay Idriss II and Bab Boujloud. There are also views over Fes from the nearby hillside at dusk. 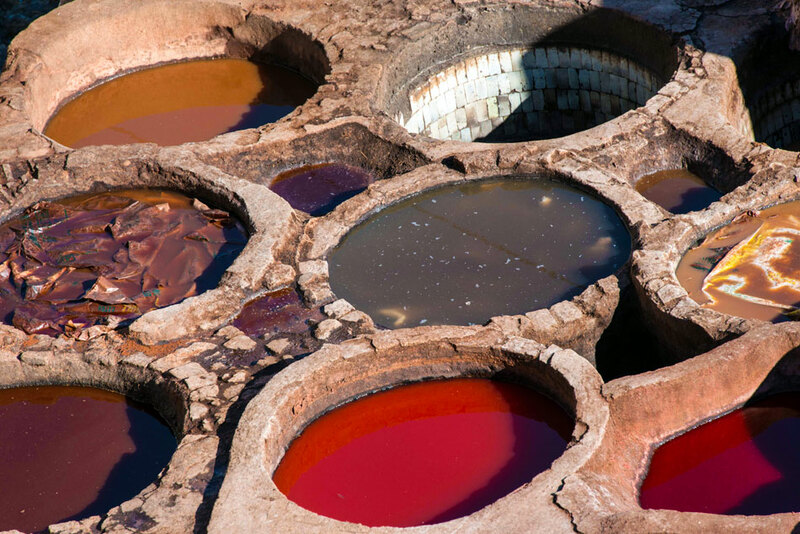 These photography travel tours also include the tanneries of course, another major photographic opportunity. 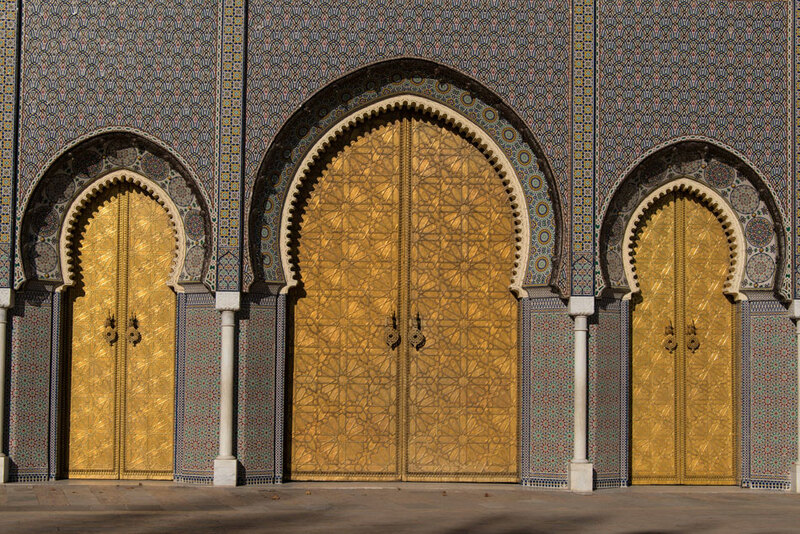 Morocco’s great architecture resides in the Imperial cities of the north. Fes is home the King’s Palace, Dar El-Makhzen of Fez, the big door which you can photograph. Also there is the Islamic craft and artisanal work to the exteriors of Moulay Idriss Mausoleum, Al-Attarine Madrasa and qarawiyyin mosque library (opened to public – 2016) as well as numerous entrances, most notably Bab Boujloud, which has been renovated in the last 10 years to include a no entry sign in its midst. It can be framed out or Photoshopped course. The streets are safe and relatively hassle free, there are just some self ‘appointed guides’ when you’re close to the tanneries. Chefchaouen, situated in the Rif mountains, is the furthest north we visit. The heavily painted walls and doors, believed to be blue to reflect the spiritual life up in the heavens, can best be recorded in the early morning light. Traditional Moroccan women in the Rif style their dress differently, wearing stripped clothing with shawls. The quiet backstreets make it an ideal location to wander and practice street photography free from hassle. Our visit to Volubilis takes no more than 2 hours to explore. It’s worth researching on Google to see the kinds of views that work for you. Tightly cropped photography on the motifs is possible as individual ruins are not off limits. All the hotels on the tour are 3 star Riads with air conditioning. There’s no room sharing or supplement coming as a single person – you’ll have your own en-suite private bathroom. Couples are welcome and this is also a popular option. Evening dining is regional cuisine. Alcohol is available at 2 of the hotels on this tour. All the hotels can cater for vegetarians and vegan diets. The hotels we use are as follows: Riad Cascades at Ouzoud, Riad Ahlam in Fez, Hotel Alkhalifa in Chefchaouen and Riad Lahboul in Meknes. As per usual the websites aren’t always as good as the product, particularly Riad Ahlam which is a splendidly renovated Riad with high quality rooms. The photography travel tours to the northern cities tour is scheduled for March and November each year. Initially the tour is open to previous guests and friends. The tour will be led by myself starting in Marrakesh heading up to cascades and then onto Fez, Chefchaouen, Volubilis and Meknes in that order. In the imperial cities we’ll go to the most photogenic architectural sites whilst in Fes and Chefchaouen you’ll also have the opportunity to walk around the streets by yourself. They are much more accommodating folk than in Marrakesh when photographing in their vicinity. Transportation will most likely by in the 4×4 with the group size limited to 4. The price is £1595 each based on 3 persons as a minimum for the 9 days which includes accommodation, breakfast and a guide fee in Fes. The price for couples sharing a room is £1495 each. There’s a 10% discount for previous guests. 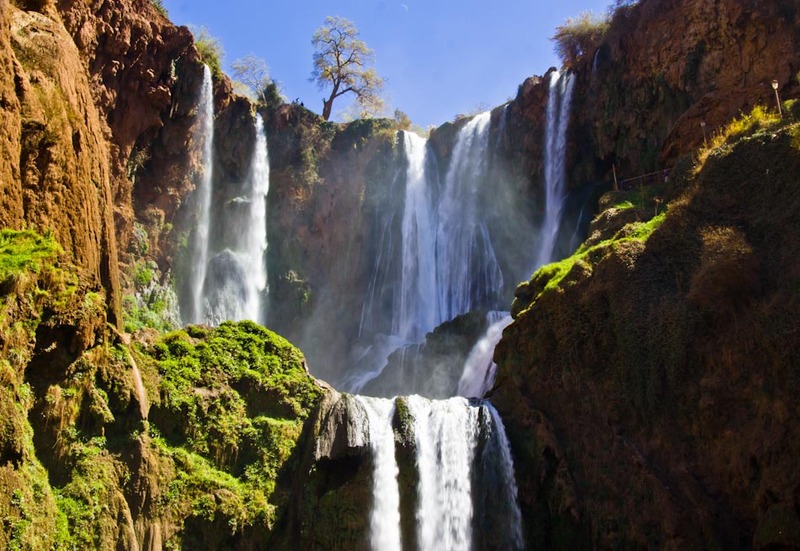 Most likely Marrakesh provides the most options into the country for flights. Ryanair also run a 2 weekly service into Fes from London Stansted for which I can make price and tour length adjustment. CHOOSE A STARTING DATE FOR THE 8 DAY NORTHERN ROUTE TOUR. “Having been out with Darren on three previous trips, I knew we would be seeing some excellent photographic sites and we were not disappointed!..there was a lot of travelling involved but the compensation was seeing the rolling hills and thousands of hectares of fertile valleys – so different from the stony deserts further south. There was plenty of opportunity for street photography but also for architecture and landscape. Our favourite was Chefchaouen, the blue city, where the architecture was so different and unique that you could not fail to take some brilliant images. The people there are so friendly too. We were accommodated in traditional Riads which were very good and also provided excellent catering. Being only three hours and ten minutes from Gatwick, this is a fabulous way of getting exposure to a vastly different culture and amazing photographic opportunities”. Peter Wyles.